Now here's an interesting paddle project. A few years ago I was contacted by a fellow in Edmonton about making a special paddle using some walnut that was cut from a tree that was growing on the family farm. Edmonton Alberta, as you may know, is not within the normal growing range of walnut, so this tree was small and had quite a few knots. It was quite a challenge gettting a paddle out of the wood that was supplied. 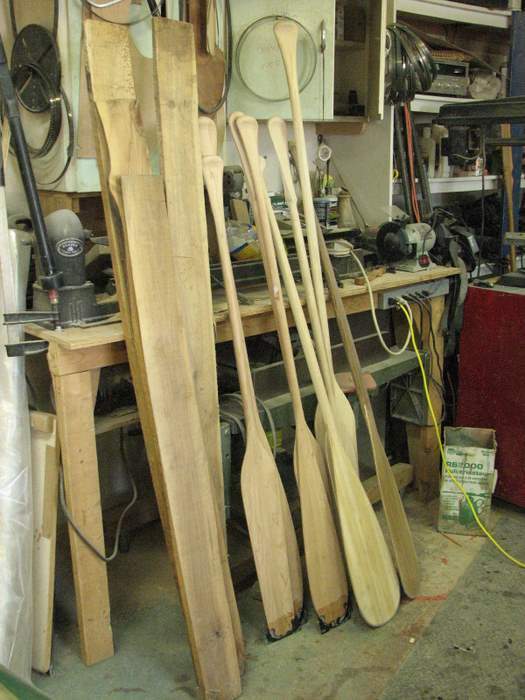 The client was very satisfied and recently sent a few more boards from that tree for me to make a paddle for his son. Unfortunately, this batch of wood was not even as good as the first, at least as far as getting a good straight piece prepared for the central paddle shaft. 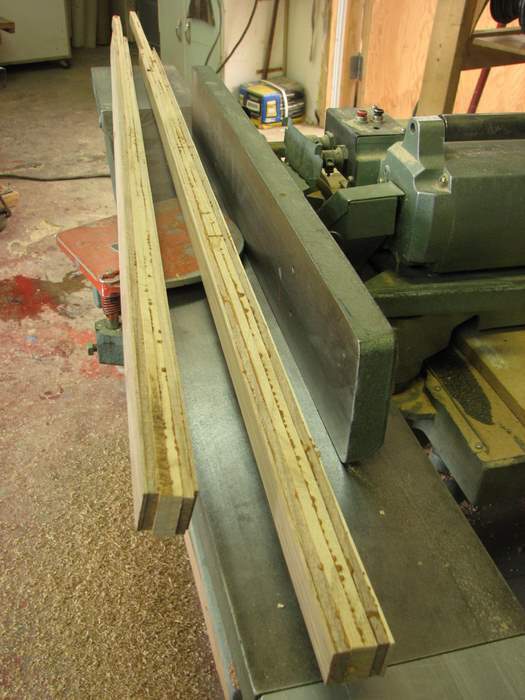 The wood had knots in the wrong places, and was warped so much that there was not a straight section within it. Here is a shot of the wood as it arrived. It looks OK in the photo, but you can't see what I see. What to do? 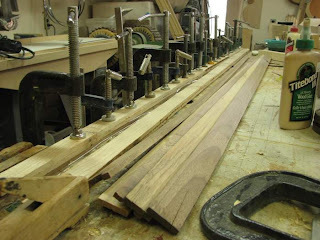 I had no choice but to resaw the biggest piece into smaller slices and laminate them up into a straight paddle shaft. This eliminates the defects from the structural paddle shaft, and ensures that it is straight. Working this way I was able to get 2 shafts made instead of none. Once the glue cures I mill it straight. The lower face has been passed over the jointer and now the other side is ready to be evened with the planer. After this I will be preparing the wood that will form the blades and grips. Posted by Doug Ingram at 8:49 a.m.